Dorsetware are a chrome plating company which offers chrome plating services in Poole, Dorset, Wiltshire, Hampshire, Devon and the M3 corridor. Chrome plating produces a chrome finish that is desired for decorative purposes, corrosion resistance, surface smoothness and hardness. 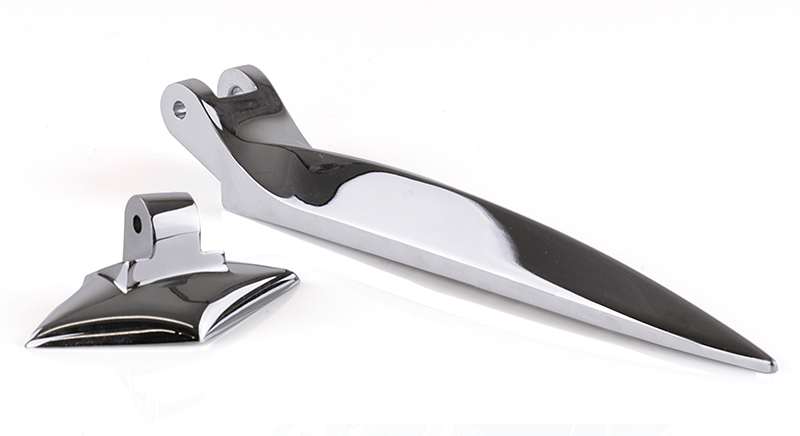 We often apply a chrome finish onto everyday household items, classic car parts or motorcycle chrome plating having stripped away old chrome and replaced it with new, polished chrome. Sometimes referred to as triple chrome plating, our chrome plating and hard chrome plating services involve electroplating copper as a precursor to the nickel and then the chrome onto the object. The copper and the nickel layer provide the smoothness, much of the corrosion resistance and the chrome provides reflectivity. View our brief guide to chrome plating for more information. Get in touch with the technical team to discuss your chrome plating requirements or for more information about chrome plating prices. Call us on 01202 677939 or visit our contact page.